Four years ago I was asked to start a sales division at Paychex Inc in our Retirement Services group. We created a salesforce that went after Large 401(k) plans in the market place in a area we had little or no experience. I went from being a top director in the company who was well respected to becoming a pariah. This was due to the fact that we had to recruit and take a lot of the best talent within Paychex to start this. Today we have a successful salesforce of over 80 individuals and our Large Market 401(k) sales division is considered the most successful start-up we’ve ever done. We have the highest client retention in the company and we are the highest growth salesforce in the growth division. More importantly we are back to partnering with all the other divisions in Paychex. Side note: I have moved over 4 times in 20 years with Paychex. Each move is a big transition with bigger roles and bigger experiences with bigger learning curves. On a personal side, I played college hockey and was always very active. (Think 6’2” 215 lbs) Once I graduated college at age 21, I threw myself into my career. Fast forward 20+ years, I’d managed to take all my passion, discipline and success from Hockey and apply it to my career but I forgot the physical discipline side. As we all know your mind and body are connected. I was 42 with a great wife Sherry and 2 great kids, Amanda and Ethan. However, I weighed 301. Between my weight and stress I didn’t feel good about myself or even work. The biggest transformation I made was adding back the physical discipline and losing 50+pounds, the right way. Through diet and exercise. 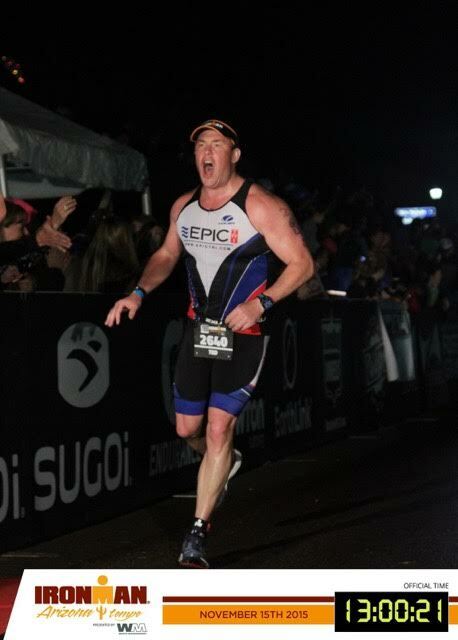 I have completed 4 70.3 1/2 Ironman Triathlons and last November completed the Tempe Arizona 140.6 Full Ironman in 13 hours. I am a better husband, father, leader than I ever was. I am doing another full Ironman Vineman in July. Good news, the weight is still off. Patience Ted, Patience! I spend my 20’s really trying to worry about career and getting ahead. I didn’t come from my money so I was terrified about not being able to provide or earn. I was a 3 time district sales manager of the year before I was 30 years old. Become a director at age 32. I’d tell myself to enjoy myself more and take care of myself. But hey, I turned out ok. Can’t live with regrets. To live life fully. Embrace competition to make everyone better around you. Be loving and caring, be a good steward of all the gifts God has given me and my family. Never worship money, you can’t spend it when your gone, but by always being a top producer, manager or worker, money will come. I see the Special Forces community as a group of dedicated of military individuals who live by a code of top performance. I can use my gifts of collaboration, compassion, competition and discipline to help them transition and learn from others experiences. Mine and others I’ve witnessed. I have always respected the military and admired Special Forces. To be in an all-volunteer military and then volunteer to be the top 1% in a highly dangerous career is admirable. I have spent some real quality time with some guys who I’ve become friends with. Tom Cranmer, Jon Fussell, Coleman Ruiz, and Alex West. If I can help individuals like these succeed after their time in the military it would be an honor. I could write 5 paragraphs about this! I also just mentored a Chinook pilot from the 160th, Lt. Col. Brett Jackson, who is retiring in June. We got along so well and was so impressed, I hired him as a Sales Manager for Paychex and he starts in August. Give feedback it’s a gift. Without feedback or after action reviews you can’t get better. Not only do you have to give feedback but you must embrace feedback. Feedback is really being a good Teammate and Followership. I have been in many situations where people “go along to get along” and miss giving the feedback loop. This is not a high performing team and eventually it leads to poor execution and development.